The great thing about tool caddies is that they’re so versatile, and can be used in so many ways. 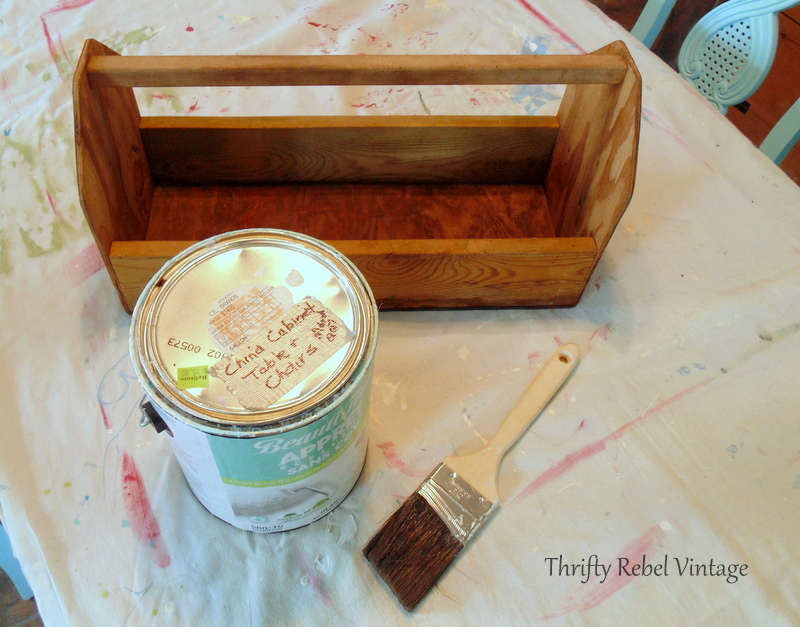 For this tool caddy makeover I’m using this old wooden one that I found at my local restore for $5. 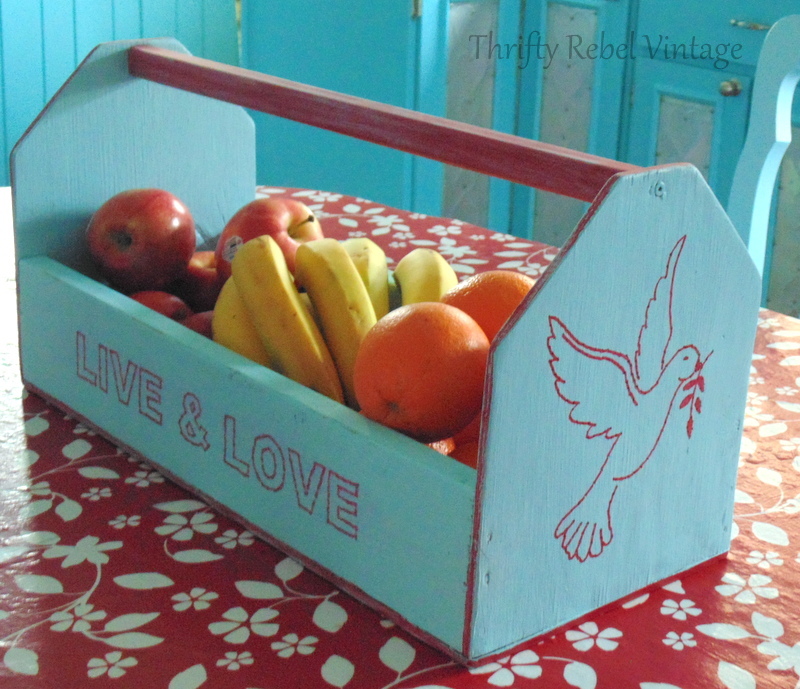 It’s handmade and a little old and worn, but that makes it the perfect candidate for a faux redwork makeover. 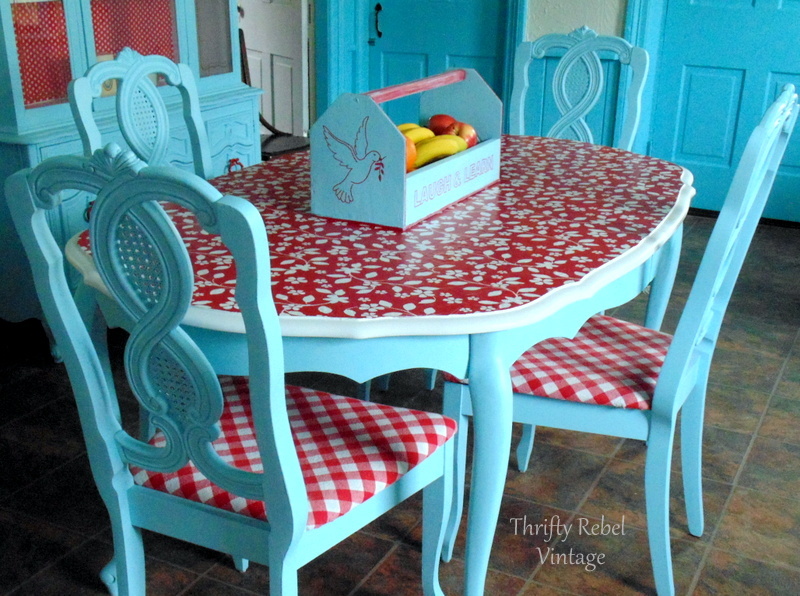 I’m using the same paint that I used on my kitchen china cabinet and table and chairs. It’s a paint and primer combo that I mixed myself. 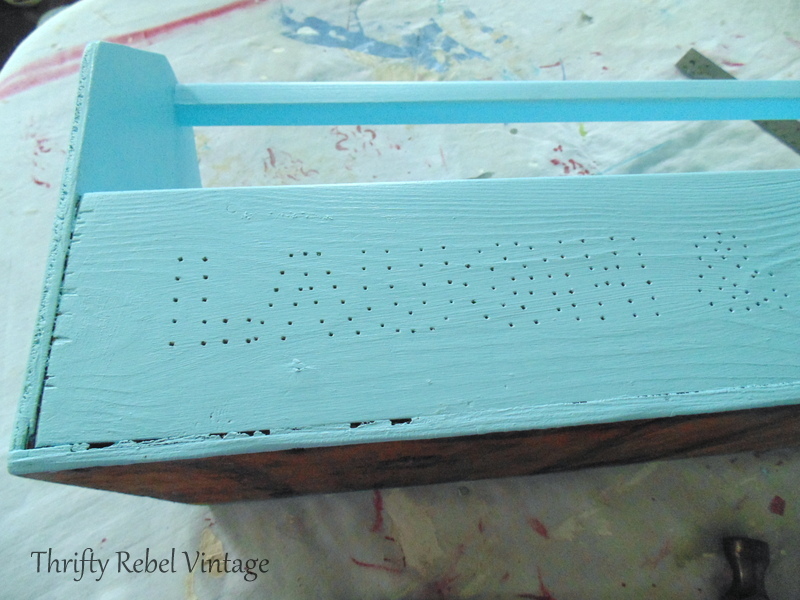 When you mix your own paint it’s a good idea to write on the can what projects that paint was used for. If you ever need to do touch-ups it’ll be easy to find the paint that you need. I use a piece of duct tape and a permanent black marker. Monkey is often my project supervisor. John shook a bag of treats and, just like that, she abandoned me. lol. To tie this in with my rolling pin window valance I decided to do the same faux redwork technique. 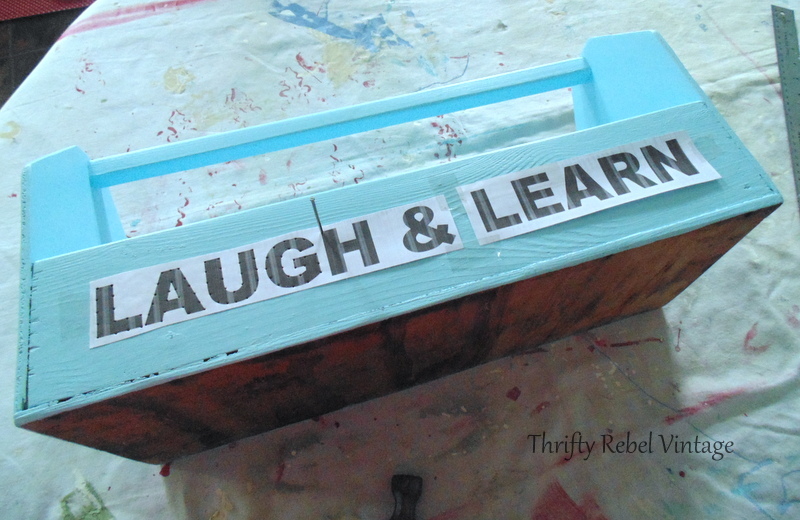 I printed one of my mottos using 120pt Arial Black font, and taped it onto the caddy.. I didn’t want to limit the use of my caddy by using specific words.. Besides, I prefer to use words and phrases that inspire me. 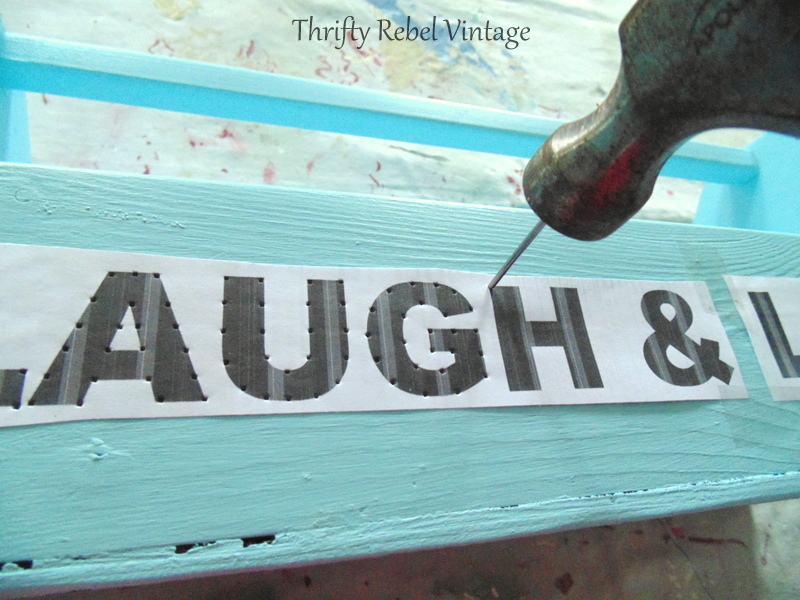 Using a hammer and a finishing nail I outlined the letters with small holes. Here you can see what it looks like after removing the paper. 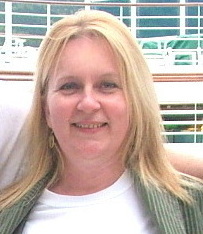 I’m peace loving kinda gal who was born in the 60s. 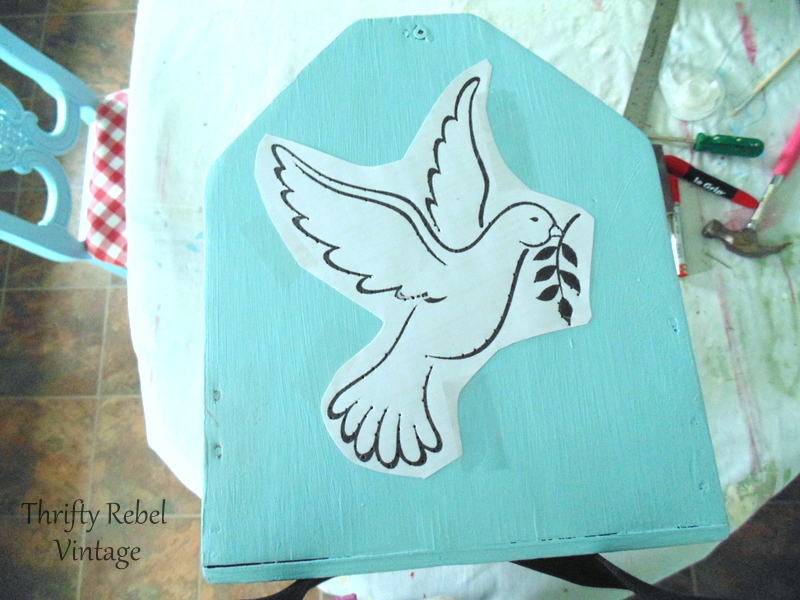 So I decided to use some free clip art of the dove of peace on one end of the caddy. I used the exact same technique with the hammer and nail. 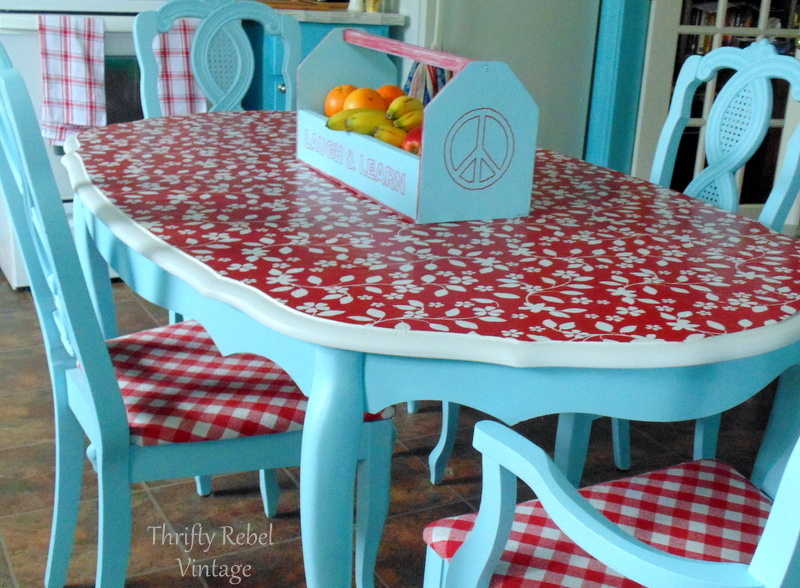 To get the faux redwork look all you have to do is join the dots with a red permanent marker. I coloured the handle and did some red edging with the marker as well, and then I gave it a light sanding. …and the words live and love on the other side. 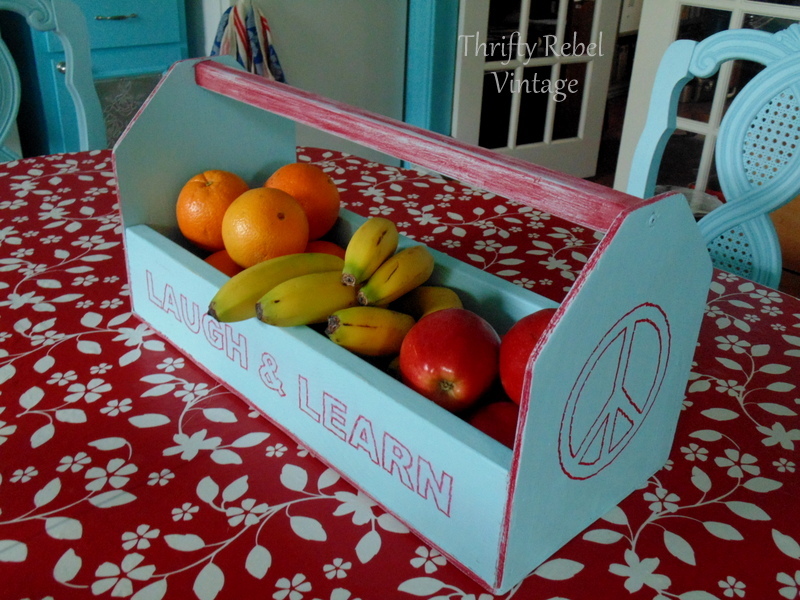 John and I eat a lot of fruit daily and most fruit bowls are just too small so I’m loving repurposing this large caddy. It holds quite a bit of fruit, and fills the table in nicely. On the rare occasion that John and I eat at the table, or if we’re playing cards or having guests, the caddy can be easily moved out of the way on to our decoupaged recipe counter. I might just keep it there. Now that I see the pics it might be a little too matchypoo on the table. So if you ever see a tool caddy at a decent price pick it up. 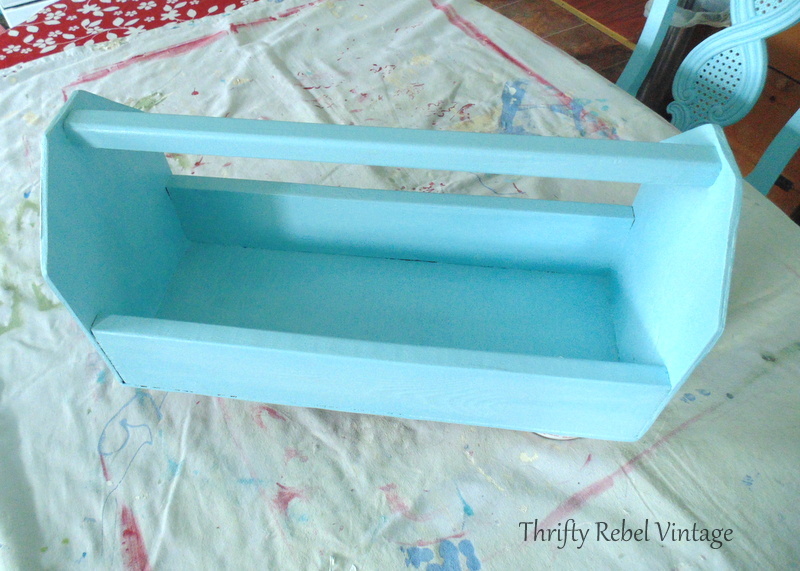 The repurposing possibilities are endless; the kitchen, craft room, bathroom, bedroom, a child’s room, garden shed, or even as a planter… and probably some others that I can’t think of right now. Tool caddies… not just for tools anymore. Thanks Florence. I wasn’t quite sure on this one if I was taking it a little too far with it on the table. Sometimes I really can’t restrain myself, so maybe I should stop trying. lol. Thanks for pinning! What a great idea! Perfect for fruit. I like it both places. Thanks so much Mary! 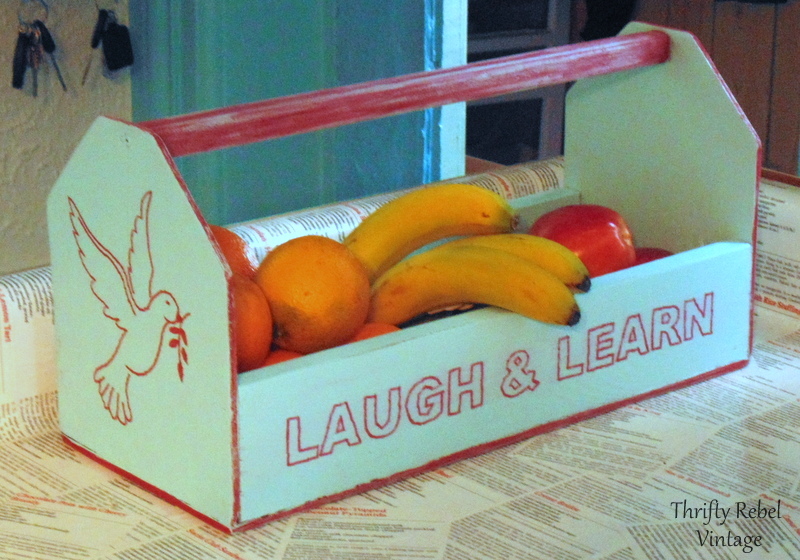 It pretty much holds our week’s worth of fruit. I’ve never been able able to keep it all in one container before, so the caddy is working great. Your combination of the red and aqua is so pretty. 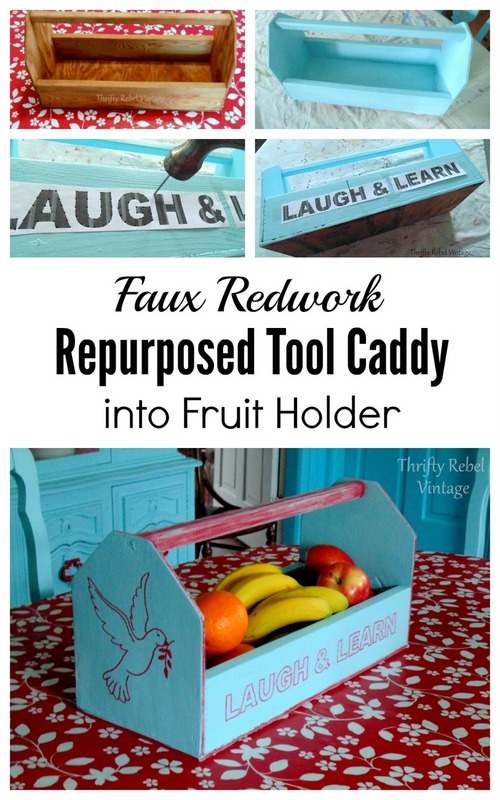 Great repurpose on the little tool box. Thanks so much Sharon. I’m so glad that I found that vintage mixer that inspired this whole kitchen makeover. It’s so fun how a whole room can be inspired by one small thing. 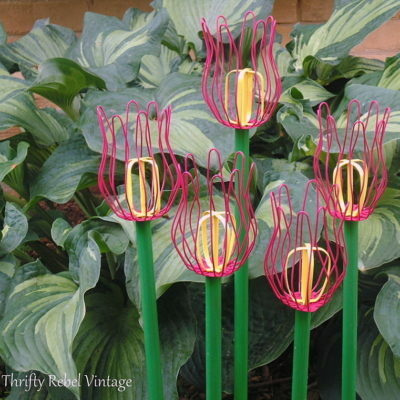 Really like this idea…..you could make it ANY color & put ANY thing in it…..flowers, silverware, S&P, napkins, etc. for a picnic, lotions & perfumes, cleaning supplies, books…..so many things. Thanks Linda! Absolutely. All those ideas are awesome! Tool caddies like this are so versatile. I’m now on the hunt for more for other areas of the house. Thanks Dona! I’m so envious of your weather. I wish I could come down there. I’m starting to forget what it feels like to be warm. We’re wearing winter coats here. Yikes! 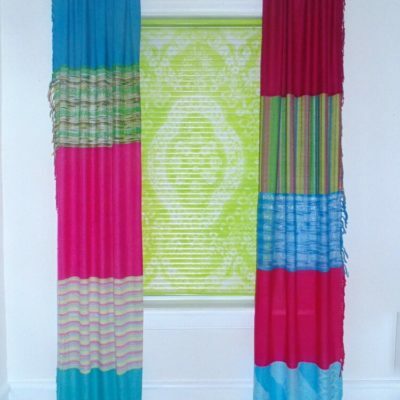 Love this project Tuula! 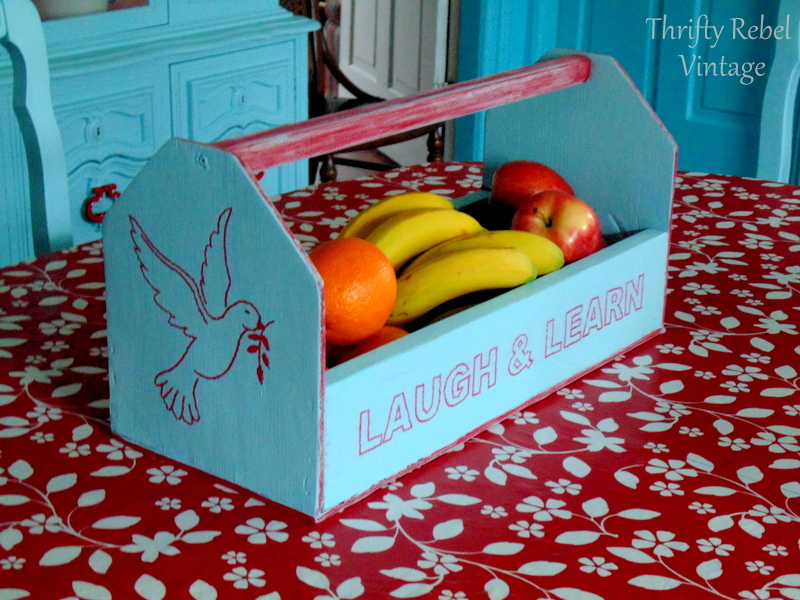 The faux Redwork you do is so cool :o) I like it on the kitchen counter best. Thanks Tania! The faux redwork is really fun and easy to do. Another cute addition to your cute kitchen! I saw a tool caddy just like yours today and passed it by….sigh…. Our weather is the same as yours. We actually had a tornado watch yesterday. Crazy for NY state! 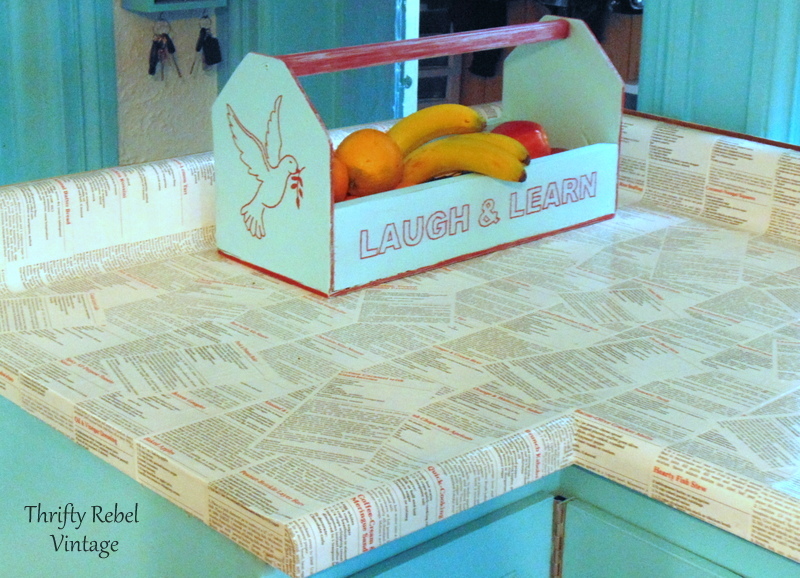 That is so cute and what a wonderful make-over to go with your kitchen décor. Looks great both on the counter as well as your table. It does give a nice color sitting on your counter. Turned out really cute. Matches your theme too. I fall more in love with your kitchen each time I see pictures! Im gonna have to find my “inner Tuula”! Thanks for all the inspiration I’ve picked up from your newsletter! I cannot believe you painted on top of that lovely table top!!! I always pick up tool caddies. I am stealing the idea of the holes. Hold on to your peace sign – this is the FIFTIETH Anniversary of the Summer of Love!!! Everyone is supposed to migrate to San Francisco with their canes and walkers. Ha! I love to live dangerously. The weather’s been too cold to paint outside, and I’m short on space these days. Too much stuff in the living room because of reorganizing. Story of my life. 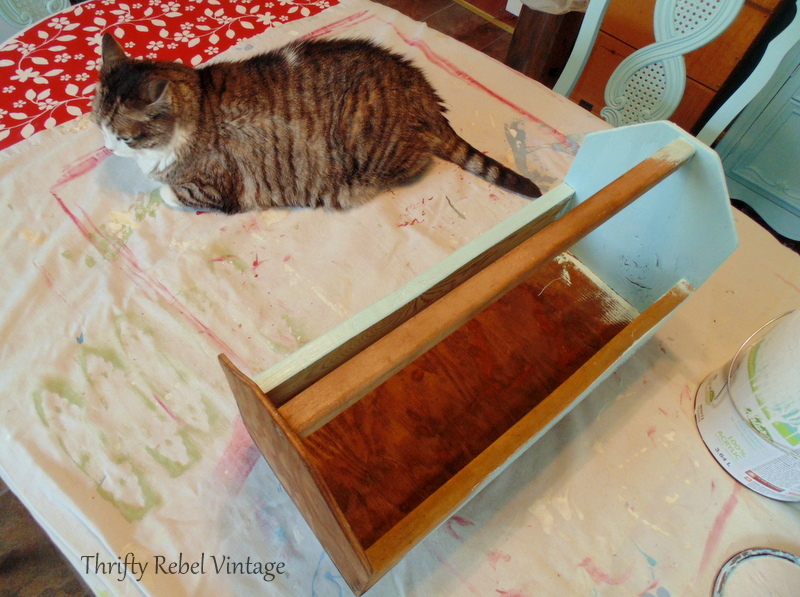 Since I did my faux redwork on my rolling pin window valance a while back I want to do it on everything. It’s so fun! I’ve always been a 60s girl at heart, but I was only 6 years old during the summer of love. Peace! Tuula, I love the look of your makeover! Hard to believe you only spent $100, or under that. I just love the repurposed tool caddy & I love the table, love the unique valances, love the how you did the counters & backsplashes. Most people hire this kind of work out, so when you first told us you were going to do a kitchen makeover, I figured that was what would be happening. I can’t believe it would be any better going that route. Everything looks so good & nicely coordinated. Thanks very much Florence! It was a lot of work, but I’m so glad I did it. We’re so much happier with the room now. I really want my home to be bright and cheerful. By the way… I’m way too thrifty to hire anything out… or should I say cheap. lol.